​Although otherworldly in appearance, Cornish Rex cats originated in Cornwall, England, where one first appeared in a litter of barn cats in 1950. A cream-colored male, named Kallibunker, was covered in tight rows of tiny curls, giving him the appearance of a miniature lamb. As he grew, his differences from his littermates became more dramatic: a slender, fine-boned body standing on long legs, a narrow head, enormous “bat ears,” and a long, whippy tail. Kallibunker was a genuine mutation and was bred back to his mother to produce curly kittens. 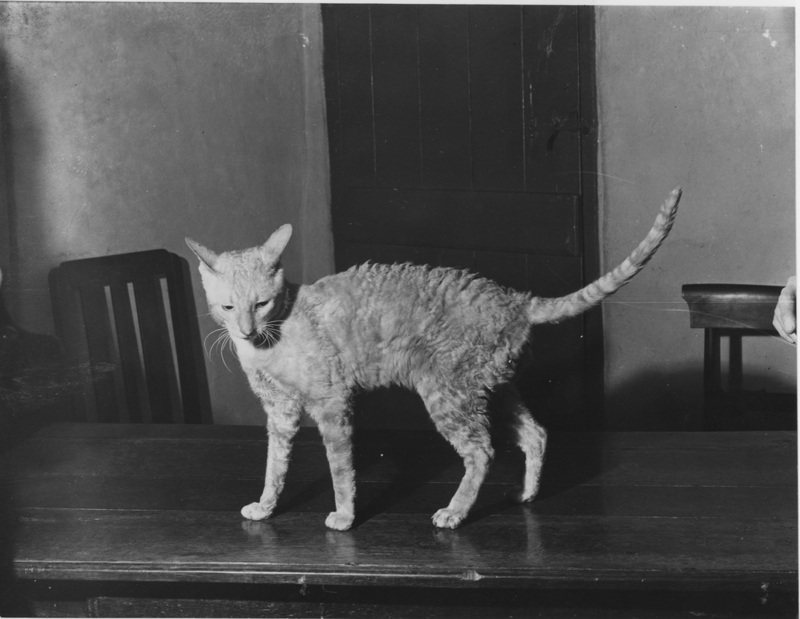 The curly coated cats were bred with Burmese, Siamese, and British domestic shorthair cats, resulting in a broad genetic base for the Cornish Rex breed and the knowledge that the gene was recessive. The energetic and elegant Cornish Rex bounces through life and into your heart with undaunted enthusiasm. They are a natural breed originating from a mutation first recognized in England. Often referred to as the Greyhound of the cat world because of their long legged body complete with tuck-up, the Cornish Rex is easily recognizable by its wavy marceled coat. These curls go from their eyebrows to their whiskers and all over their body. There is NO hypo-allergenic cat, but the Cornish is considered a good choice for people with allergies as they do not seem to aggravate them as much as other cats. Their large tall ears and soft, big oval eyes blend into their egg-shaped head giving them a wonderfully expressive appearance. Smart, social cats, they know their place...right in the middle of everything! The Cornish Rex has a racy slender, body which stands tall on its legs. Do not be fooled though, while these cats appear fine boned and elegant they are actually hard bodied and muscular for all their dainty appearance. They have a natural arch to their back that matches a tuck-up to their waist that flows into a long tapering tail. The Cornish have dainty oval paws and tend to walk high on their nimble toes. Their head is often said to look like an egg on its side with high cheekbones. They have tall ears that sit high on their head, but not so high as to give it a donkey-like look. Cornish Rex have oval expressive eyes with a slight upward slant and a patrician roman nose.